Fast buck? What’s the speed limit on a buck? How can you tell a fast buck from one doing the statutory 30 miles per hour? The predators themselves know they have nothing to fear from yet another empty crowd-pleasing political promise. Promises made by Labour, Liberal, and Tory alike, all to pledge to the ordinary ripped-off British voter that they would do something if only they could. Predator and politician know there is always a commentator ready to say on air, online, and in print how hard it would be to separate the producers from the predators, and how it would never work, and that it would do more harm than good in any case, and regrettably it would be best to leave things as they are. Of course these commentators aren’t speaking to Producers, Predators, or Politicians. They are speaking to us ripped-off Britons. They speak to convince us that nothing can be done, and we should allow ourselves to be preyed upon in the greater interests of the nation. Politicians and predators rely on this, to provide cover for political inaction and continuing predatory depredations. It is of course true that many companies fall somewhere in between being clearly "good producers" and despicably "bad predators". However, using this fact to block any action is just a weak, though generally successful, attempt to disguise the fact that there are clear unambiguous villains out there. Just because the whole business world doesn’t need a mighty smack, doesn’t mean there aren’t specific rotten rip-offs that do need to be caned and expelled. A perfect example of an unconstrained predator, a predator who for decades has paid protection money in the form of taxes and levies to successive governments for its licence to continue freely predating, is the pensions industry. The key characteristic of a successful predator is the ability to sneak around unnoticed until it has got its prey by the throat. The Pensions Industry is master of this form of ambush-predation. With gentle sounding charges of 2.5%, much less than the 15% service charge you pay when you go for a restaurant meal, the pension funds can grab nearly half of a lifetime's savings. Something you may only realise when you get the letter announcing your pitifully disappointing pension, discovering too late the jaws of post-retirement poverty that have been tightening on your throat for the previous 40 years. a) enlarge the size of the pension pot: by increasing the rate of contributions, and making people work and contribute longer. c) reduce the number of years the pension has to be paid to the retiree: by making the employees work a few more years, thus spending a few less years collecting their pension in retirement before shuffling off to the next world/incarnation/ash-cloud/worm’s belly. If politicians were actually serious about dealing with predatory companies then all the above can be solved with a stroke of a legislative nail-file, by blunting the claws of the predatory pension providers. As we will now demonstrate in an adult-friendly graph, people can get bigger pensions and retire years earlier if charges made by pension funds are slashed. After all, those charges go to pay the bumper bonuses – so this will not only alleviate pensioner poverty, but will also start to deal with excessive pay. So, how many extra years do you have to work to pay the fund management charges on your pension? As can be seen from the table above, taken from the UK government's online "the money advice service", reputable pension providers charge between 0.5% and 2.5% per annum to manage your pension fund. And here's the ambush. An annual 0.5% charge takes a reasonable sounding 13% of your final pension pot compared to what you would have got with no charges at all. An annual 2.5% charge takes a growling, hissing, slashing, biting, squeezing predatory 50% of what would have been your final pension pot! The graph represents someone saving £100 per month, with an investment return of 6%, with each line representing a different charging rate. The difference between a 0.5% and a 2.5% charge is about 9 years of additional work to get the same sized fund. At current annuity rates, a £100,000 fund will get you about £6,000 per year flat rate for the rest of your life, and much less if it is indexed. For each £100 per month you save you would build £100,000 in about 31 years on a charge of 0.5%, but it would take you over 40 years on a charge of 2.5%. If you were happily on the 0.5% charge and decided to work the extra 9 years in any case, you would build up an extra £70,000 in that last 9 years. It is said that we can't target all predatory companies, because some companies aren't unambiguously and solely predatory and could be unfair if they got caught up in the net. Maybe so. But that doesn't mean those companies that are clear and present predators can't be brought to heel. This is not anti-business, it would make business better at what it claims to do. And it would make us ripped-off Britons, who are after all the predators' prey, a little less ripped-off. Some firms charge more than others? Shock, horror probe! It has always been this way and as long as they can get away with it, it will continue. Having said that, the cheapest is not always the best...you know, the monkeys, peanuts scenario. Pension charges of 0.5% pa...maybe if you are going down the passive investment route and you elect not to pay for any advice. Strangely enough, the passive route does not always come out on top. You are missing the point that some firms charge more but generate better results. Using your example, don't forget that some firms do not want the £100pm business and so charge themselves out of the market, they provide the contract but that's it, they target bigger premiums and as premiums increase so charges reduce significantly. I may be wrong, but are you comparing like for like in your article? Some of those funds are passive, index trackers, and others seem like actively managed funds. Passive funds are always cheaper because the firms just buy futures and take no part in managing the money. If you have someone running the money, trading assets, and outperforming the index, then of course it is going to cost more. In the end, the gamble you have to take is whether your chosen manager will outperform the passive fund over the long term despite the extra costs. If he does, and you have paid the charges then you are quids in. If not....well then you can feel disgruntled but ultimately, the choice is yours. I am not an apologist for the pensions industry but honestly, this article is too simplistic. Do a bit more research and stop being all 'Daily Mail' about your 'findings'. Do actively managed funds provide consistent returns? "According to the quarterly survey of funds for "Quarter 1 2011" by Thames River Multi Capital (TRMC) only 1.3% of funds (16 out of 1,188 funds with a three year track record) made it into the top 25% 3 years in succession." I recently paid quite a bit for some financial advice and was told that actively managed funds cost more and rarely produce more. The market trends flux yes but are notoriously difficult to predict (it's gambling, you study the form but you are still gambling) and over time are fairly constant. So leave alone. In When paying for advice to those who study the form and making all the transactions we pay more than you would a good tipster. Why? The myth that financial experts can produce wealth. But as noted in the main article this is so much that the wealth creation benefits the financiers. I liked the article, it challenges the high costs in the financial industry and I agree this is one area where the Government needs to step in as the markets will not and cannot regulate themselves. Thanks original replier- that definitely needed pointing out, personally I can't stand one-sided rants. For the latest poster (20 June) I'd remind them of the whole Stakeholder pensions farce where the government did indeed step in, slapped down costs to 1%pa in the promise to the industry that this would mean everyone would have a brilliant, low-cost pension so the pensions companies wouldn't go bust. Unfortunately while 1%pa provided enough to the companies to run and invest a pension in a basic fashion it didn't provide enough for people to 'sell' pensions and so the take-up wasn't great, despite the wonderful low cost, and the industry suffered badly. Virgin Money, who lead the charge for the 1%pa benchmark despite warnings, only offered a choice of two very basic funds (for which 1% is actually pretty expensive) and still never made much money/made pensions popular. Don't get me wrong, I'm all for the availability of low-cost pensions/investments but the pensions industry in the UK is really pretty efficient and these are already available if you do some research or get an adviser to do it for you. For most people they won't be impoverished in retirement because they were paying 1.5%pa instead of 1%, it's because they've never been encouraged to get a hold of their financial situation. @Mark - rather a narrow minded and middle class comment at the end, which unfortunately undermined your comments. How does a person on the minimum wage or even the living wage 'get a hold of their financial situation'? Rob a bank or 2? There are millions on very basic pay in Britain. Now even those in mid level professional jobs like nurses and teachers are having pay and pensions slashed. Comments on here are exactly why this country has become a corporatocracy or in my view a kleptocracy and is bankrupt. Too many people who are 'I'm all right jack' are actually apologists for the rip-off merchants. Lower fees charging pensions have not been successful for one simple reason - greed is god - at any cost. No, which is why it pays to have a pension that can invest in a range of external funds where you can monitor performance from independent third party sources such as Trustnet and move your money around. Expecting top quartile returns all the time is a little unrealistic. Fund managers seem to fall into two camps, those who follow short term trends and rise from obscurity to top quartile rankings, only to disappear without trace after a while, or those who have a good, long term philosophy and stick to it. They will tend to give investors above average returns most of the time and top quartile some of the time. Periodically, they may dip into the third and fourth quartiles but IMO this is simply an opportunity to pick up a share of well managed funds comparatively cheaply (pound cost averaging). Buying external funds through a pension can be expensive and you ought to expect higher charges but if you look after your money and follow the proven market leaders, you should ultimately do better than just leaving it in a 'vanilla' insurance company managed fund. BTW, you do not need a have pension fund to make this worthwhile. There is a risk in all of this but if there wasn't then we would all have final salary pension schemes and everyone bar the employers would be happy! 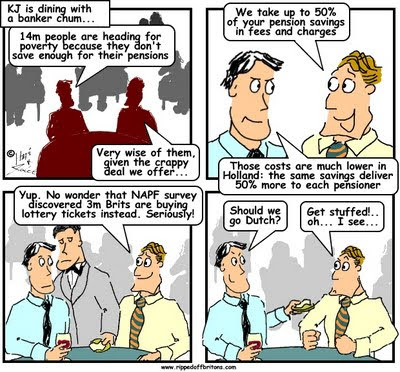 "Britain is one of the only countries in the developed world which has had a negative return on pensions for the past five and 10 years," says Morten Nilsson from Denmark's ATP, which, thankfully, is setting up in the UK using the brand name Now: Pensions." Just a thought there. If you are buying a money purchase contract, the size of your pension fund is primarily determined by your contributions, the charges and fund performance. If you do not save enough, you will end up with a small pension. If your chosen fund serially under performs and you do nothing about it, you may well end up with a small pension. If you feel your pension policy is expensive, do something about it and find a contract which meets your cost criteria. To an extent, all these areas are within your control. If you simply opt for the first plan that you come across and let it run until maturity, then you are partly to blame for your predicament. Some of the most expensive policies are old 'Retirement Annuity Contracts'. By today's standards the charges are phenomenal but... many of these old plans come with guaranteed annuity rates so the policy holder can benefit from much better terms than those on the open market. I recently came across a plan with annuity rates set at 11.6%, nearly three times better than the best rates on the market. My point? Cheap is not always best. Finally, an area you can't really control are annuity rates. Low interest rates and gilt yields, improving mortality data etc all conspire to reduce annuity rates. Pension company/ Fund Manager charges are not the only culprit. Control what you can control, take an active interest in your pension, ask questions and make decisions that mean you end up with a pension that is run on your terms (as near as you can). If you sit on your backside and do nothing, then to an extent, you deserve what you get. The biggest problem about pensions in the UK is not the cost, it is the fact that people refuse to take responsibility for their future. This is more important than printing 'Daily Mail' alike stories about charges which do little to help people to help themselves. The purchasing power of everyone in the UK needs to be pooled so that pension accounts can benefit from institutional charges. The hoops you have to jump through to make sure that your pension doesn't lose money waste so much energy that surely you could put that effort into choosing good investments for yourself and simply cash out at the end of a lifetime of investing your own money and have plenty of cash to live on for the rest of your days. Pensions seem little better than the building society account I had when I was ten. UK pensions are not efficient for the people paying the least. Take a nurse as an example, colleagues in Holland will get 33% more than a person in the UK paying the same amount over the same time period.